South Korea and Iran are set to begin discussions on boosting their bilateral cooperation in the fisheries sector that will include a joint fish farming venture, the Seoul government said Monday. 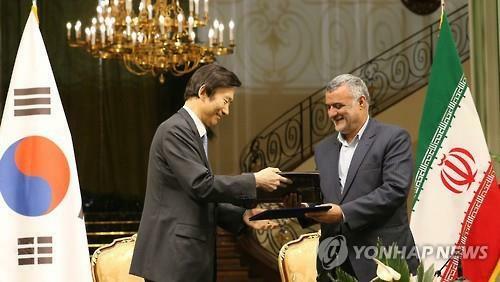 The talks will be held in Iran from Thursday involving officials from South Korea's Ministry of Oceans and Fisheries and their Iranian counterparts. The talks will discuss follow-up measures for a memorandum of understanding for cooperation in the fisheries area signed in May during South Korean President Park Geun-hye's visit to the Middle Eastern country. The visiting officials from the South Korean ministry will also check the feasibility of a joint venture in fish farming. Iran is already the largest fish farming nation in the Middle East, annually producing some 325,000 tons of fishery products through farming, the ministry said in a press release. South Korea is the world's seventh-largest fish farmer. In 2015, Iran purchased 155,000 tons of fishery products, worth $21 million, from South Korea.